And for today (and for the convenience or the local players) it’s a bonus post – a “Map” showing the general layout of the local regions of the Anomaly. Sadly, given that the layout covers about two and a half times the area of the Earth (with a much higher percentage of land, at least in this general area), actual terrain features are generally too small to be a concern. 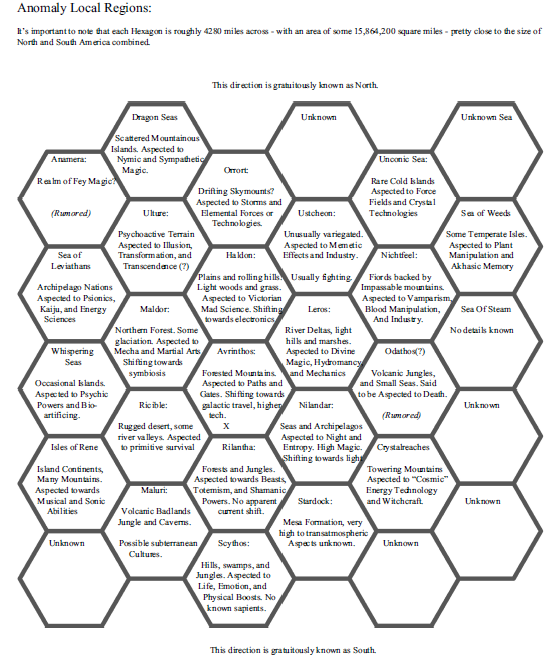 Fortunately, most “hexes” have reasonably consistent terrain, environment, and weather. There is, of course, no way that this could work naturally – but it’s hard to get much more unnatural than the Anomaly. And for the convenience of anyone who wants a better look, Anomaly Local Regions I.